Kitchen Cleaners Are Used For A Wide Range Of Residential, Commercial, Industrial Or Institutional Kitchen Sanitizing Applications. Kitchen Cleaners are available in a wide selection of brands and types for various residential, commercial, industrial or institutional kitchen cleanup or sanitizing applications. 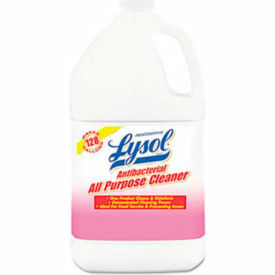 Reliable brands include Beer Clean, Earth Friendly Products®, Formula 409®, Lysol®, Mr. Muscle and Professional Lysol®. Various applications and formulas include Fyer Boil Out, Glass Sanitizers, Glassware Cleaners, Kitchen Cleaners, Kitchen Cleaner Concentrates and No Rinse Sanitizer. Available in wide range of Bottle, Squeeze Bottle, Trigger Bottle, Spigot Jug, Pail, Drum, Pouch or Packet type quantities. Dishwashing Soaps And Detergents Are Used For Use In Restaurants, Cafeterias, Banquet Halls And More. 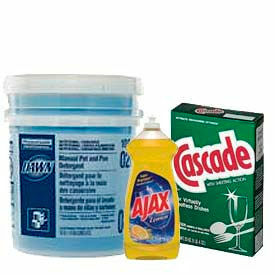 Dishwashing Soaps And Detergents are available in a wide variety of solutions and formulas for Manual washing or for use in Automatic dishwashers. many are formulated specifically for commercial dishwashers. Clean pots, pans, dishes and glassware without scratching, etching or hazing. Cut through grease and dried-on food to reduce pre-rinsing before loading. Wide selection of reliable brands include Ajax®, Beyond Green Cleaning, Cascade®, Cream Suds®, Dawn®, Earth Friendly Products®, Electrasol®, Gain®, Joy®, Nyco, Palmolive®, Simoniz®, Suma Supreme, Sunlight® and Ultra Palmolive®. Various formula types include Liquids, Powders, Rinse Aids and Pot and Pan Care offered in a variety of scents including Almond & Cherry, Apricot, Classic, Floral, Fresh, Grapefruit, Lavender, Lemon, Orange, Original, Pear, Pink Rose or Scentless. Come in wide range of Bottle, Pail, Drum, Box, Jug or Pouch type quantities. Environmentally Friendly Dishwashing Liquid Detergents Provide An Eco-Friendly Means Of Cleaning Dishes And Cookware In Restaurants, Cafeterias, Dining Halls And More. 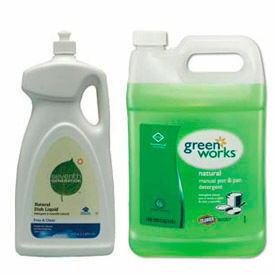 Environmentally Friendly dishwashing detergents ensure extraordinary cleaning power without the use of harsh chemicals. Ingredients are 99% natural and include essential oils and coconut-based cleansers. No animal testing. Packaging meets EPA CPG, and includes minimum 25% post-consumer content and 25% recovered content. Choose from reliable brands such as Clorox Green Works, Earth Friendly Products, e.Logical and Seventh Generation. Size types and package quantities vary by model. 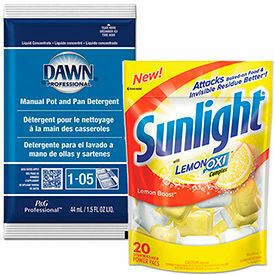 Kitchen Cleaners & Detergent Portion Packs remove stuck on food from pots, pans, dishes and glassware in a convenient pre-measured concentrated pack. Ultra-concentrated formulas tremendous freight and storage savings. Pre-portioned individual packaging eliminates dilution ratio guesswork and has no moving parts or plumbing to break down. Can be used in dishwashers and 3-sink food service cleaning operations.